Welcome back to this week’s Top 40 Countdown. If you missed the first 10 songs, you can go ahead and check them out. 1983 was an incredible year of music. The ’70s sound had pretty much disappeared, and ’80s music was building it’s own identity. At this time, I was 12 years old, and would become a teenager later in the year. I was wrapping up 7th grade, and getting ready for my final year of junior high. Now, let’s Return to the glorious week of May 28, 1983, and continue the countdown. I did not know about INXS until later in the decade, when their Kick album came out. So I was unfamiliar with this song. It is classic INXS. I really like this one a lot. It may be 1983, but this sounds like it could have been from their incredible 1987 album. Ahhh, the smooth sound of Al Jarreau! This definitely would not have been on my radar in 1983. But, I like it a lot now. This came off of Al Jarreau’s #1 Jazz album, Jarreau. This song was written by David Foster and Jay Graydon. It was originally supposed to be an instrumental that was to appear on David Foster’s 1983 album, The Best of Me. Jay Graydon produced many of Al Jarreau’s songs, so they gave the song to him. This was my introduction to Elton John. Thank you MTV! I tend to favor Elton John’s ’70s songs over his ’80s songs, but I love this one. It’s so upbeat and fun. I believe this R&B ballad has been on one of my countdowns before. I still like it. This is another one that would not have been on my radar back then, but I like it a lot now. You know it. You love it. This is ’80s personified! This was Kajagoogoo’s only hit in the U.S., but they did have some other hits in the U.K. There is no mistaking which decade this song is from! This was one of the biggest hits of 1983. 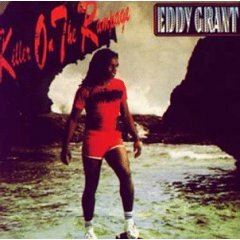 The song’s lyrics refer to the 1981 Brixton riot, the title referring to Electric Avenue, a market street in the Brixton area of London. Although I am a rocker at heart, I really love a lot of soft rock from the early ’80s. And this is one of the best. Sérgio Mendes is a bandleader, and does not sing in this one. That credit goes to Joe Pizzulo and Leza Miller. Kenny Rogers may have been the king of country cross-over music in the ’70s and ’80s, but Ronnie Milsap is no slouch either. This particular song peaked at #5 on the Country charts, #8 on the Adult Contemporary charts, and right here at #23 on the Hot 100. I love this song, even though I can’t understand the lyrics, other than the title. This falls in the same category as “Louie, Louie” by The Kingsmen and “In-A-Gadda-Da-Vida” by Iron Butterfly. This is great music, which is a lot of fun. Another ultimate ’80s song, by an ultimate ’80s band. Duran Duran was on top of the world at this time. And with songs like this, we can see why. Girls today have their One Direction. The girls of our generation had Duran Duran. Almost 35 years later, they are still going strong, having released a new album this past September, Paper Gods. And I think they sound the same today as they did in our glorious ’80s. Well, classic Duran Duran is a good way to wrap up the countdown for today. Are you liking this countdown so far? And as the numbers get smaller, the hits get bigger. So, come on back tomorrow to check out the next 10 songs of the countdown. Welcome back as we wrap up this week’s Top 40 Countdown. There have been some flat-out classics so far this week, and today is no different. You can go back and check out songs 40-31 30-21, and 20-11. Well, I think this has been one of the better Top 40 weeks, so let’s Return to the week ending June 18, 1983, and finish the countdown. Well, here’s a blast from the past. Hall & Oates were a staple of the ’80s music scene. But, this song is often overlooked. This song is actually a cover, originally done by Mike Oldfield (with Maggie Reilly on vocals) in 1982. Hall & Oates made it their own, and made it a big hit, topping out at #6 on the charts. Just like Hall & Oates, Rick Springfield had a great hot streak in the early-to-mid ’80s. This song, Springfield’s first single from his Living in Oz album, would be his fourth top 10 hit, peaking right here at #9. It was nominated for Grammy Award for Best Male Rock Vocal Performance in 1984, but lost to Michael Jackson’s “Beat It”. This synthpop song just screams ’80s! But, did you know that this was a cover? It was originally written by Burt Bacharach and Hal David in the ’60s. The original recorded version was released by Lou Johnson in 1964. Sandie Shaw also released a version of this song that same year, and it was a #1 hit in the U.K., Canada, and South Africa. The 1964 versions and this ’80s version were each a product of their time. I like all the versions, but of course, I prefer Naked Eyes. 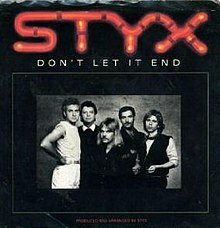 This is a nice ballad by one of my favorite bands – Styx. This song is from their divisive album, Kilroy Was Here. This was the beginning of the end of the original run of Styx, but you wouldn’t know it here. Lionel Richie immediately proved that he could have a successful career post-Commodores, with his incredible self-titled debut album. This ballad was the third single released from that album, and was his third top 10 hit in a row. Kenny Rogers, who often collaborated with Richie, provided the backing vocals on this song. 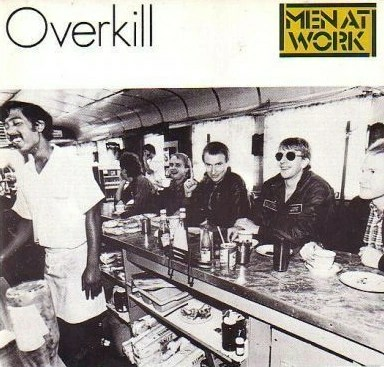 Men At Work is just pure ’80s. They were on a hot streak at this time. The combination of Colin Hay’s voice and Greg Ham on sax, gave Men At Work a very unique sound. Everyone knows “Down Under“, but this is one of their better songs as well. Speaking of unique sounding, this song was a worldwide smash hit. The song’s title refers to Electric Avenue, a market street in the Brixton area of London. You could not escape this song when it was first released, but man was it fun! All week we have been hearing from artists who had been around for a while, but were introduced to me with the ’80s tunes in the countdown this week. This is another one. I remember first hearing this song on the radio while eating breakfast before school. This song was from the album of the same name, and was part of many of David Bowie’s reinventions. This is a great song from a great album. Culture Club followed their world-wide smash hit debut, “Do You Really Want to Hurt Me”, with this song. I like this one better. Culture Club was one of those bands that I didn’t care much for back then, but enjoy much more now. Topping the R&B charts was “Juicy Fruit” by Mtume. I never heard of the song or the band. What a Feeling! and what a way to end the countdown! A few years earlier, Irene Cara hit it big with the theme song for Fame. Somehow, she outdid herself with this classic from the movie, Flashdance. This song won all kinds of awards, including the Academy Award for Best Original Song, the Golden Globe Award for Best Original Song, and the Grammy Award for Best Female Pop Vocal Performance. This is a well deserved #1 hit. Well, that wraps up this week’s countdown. I hope you enjoyed it as much as I have. This has got to be one of the best countdowns we’ve covered so far. 1983 was such an incredible and pivotal year of music. Do you agree? We’ll be back with another countdown in the coming weeks. In the meantime, Keep your feet on the ground, and keep reaching for the stars.